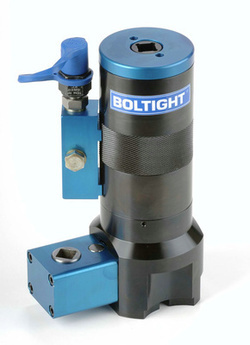 A new hydraulic bolt tensioning tool designed specifically for wind turbine applications has been launched by specialist UK-based tool manufacturer Boltight Ltd.
Called the Typhoon, the tool provides a quick, simple, accurate and reliable solution for tightening critical bolted joints on today’s modern wind turbines. Optimised for size, weight and load capacity, it is ideal for tightening high load bolts quickly in confined spaces to precise measurements - a key benefit when working in windy, remote and harsh environments. Applications for the Typhoon on a wind turbine include blade bolting, bearing to hub bolting, tower bolting, foundation bolting, outer frame bolting and hub to spindle bolting. The product can be supplied to any size as either a single stage tool for use when tool height is restricted or as a multi stage tool for use when radial width is restricted. A multi stage tool uses several hydraulic cells to generate extra load in a small diameter. A special feature is the composite materials used to produce the Typhoon’s hydraulic piston seals. These offer easy piston return, exceptional reliability and long-life performance compared to other seal materials. Even after prolonged use the seals remain firm, do not get dislodged and are low maintenance. Standard and special designs, including an optional gear drive for fast nut run-down, are available depending on customer requirements. Customers can also choose from a complementary range of 1500 bar pumps, flexible hoses and fittings. The Typhoon is CE marked and is supplied with a comprehensive 100-page health and safety, operating and maintenance manual at no extra cost. The product meets the 10.9 proof load requirement ASTM A490M and EN ISO 898-1:1999. All Boltight tensioning tools are manufactured to exacting standards to strong and robust designs. They are durable and have a long operating life. Boltight has gained a reputation for offering a fast, flexible and cost-effective service. Its products are in use all over the world in the renewable energy, power generation, offshore, oil, gas, civil and heavy engineering industries.